When one picks 13 lbs of blueberries, one must be creative with utilizing them! After blueberry pancakes, parfaits, and just good ol’ handfuls of berries, I used some of our blueberries to incorporate a natural sweetness into a spinach salad. With their high levels of vitamin K (bone health), vitamin C (fighting those colds), manganese (blood sugar control, bone and skin health), copper (antioxidant and energy support) and fiber (cholesterol and blood sugar control), these berries are a great sweet treat with great benefits! Place spinach, basil, and green beans into a bowl and toss. Divide among 4 plates. 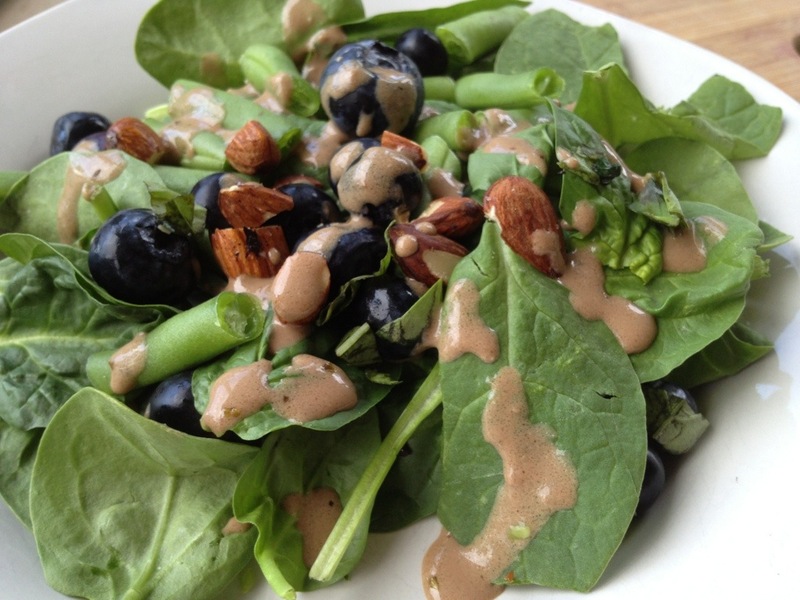 Place blueberries and almonds on top of salad, and then drizzle with dressing.